While there have been no reported illnesses, out of an abundance of caution, Panera Bread is conducting a nationwide preemptive, voluntary recall of all 2 oz. and 8 oz. 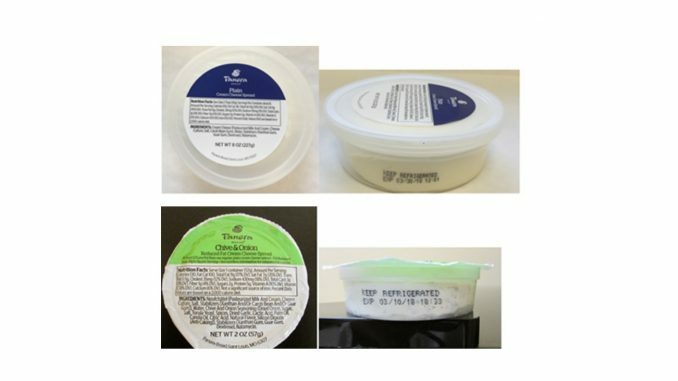 cream cheese products sold in its US bakery-cafes. Affected 2 oz. Cream Cheese Varieties: Plain Cream Cheese, Reduced- Fat Plain Cream Cheese, Reduced-Fat Chive & Onion Cream Cheese, Reduced-Fat Honey Walnut Cream Cheese, Reduced-Fat Wild Blueberry Cream Cheese. Affected 8 oz. Cream Cheese Varieties: Plain Cream Cheese, Reduced- Fat Plain Cream Cheese, Reduced-Fat Chive & Onion Cream Cheese, Reduced-Fat Honey Walnut Cream Cheese, Reduced-Fat Wild Blueberry Cream Cheese. Consumers in possession of these products should discard them immediately and contact Panera Bread Customer Service at 1.855.6.PANERA from Monday through Sunday, 5am-10pm (CST), or visit Panera.custhelp.com for a full refund. For any other questions, visit www.panerabread.com/recall.